Here is an item that brings out the inner Bwana in me. Or is that Walter Mitty? 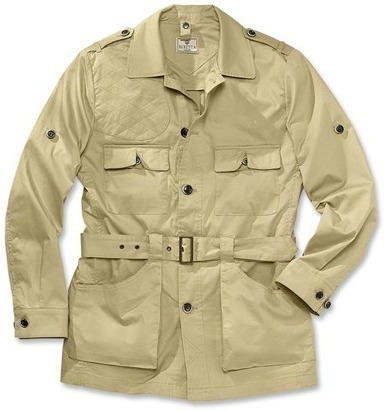 Made in China for Beretta, the Safari Jacket is made of lightweight 98% combed cotton with 2% Spandex. It features traditional bush styling in light khaki color only. The jacket has two buttoned chest pockets, two open waist pockets, buttoned epaulets and internal mesh lining on the front shoulder areas. The sleeves can be secured by internal straps and buttons when rolled up. There is also a quilted rifle mounting area on the right shoulder. (No padding to soften recoil, though, and no leftie version.) The stitching appears to be durable and well executed. To complete the classic style, there is a matching lightweight cotton belt and an antiqued brass buckle. The belt has similar eyelets for belt adjustment points. Sizes available are M through 3XL. The Beretta stock number is GU031T0439010XM and the 2015 MSRP is $145, but it occasionally goes on sale. I purchased a size Medium and it fits loosely for air circulation. I think it will be a comfortable sun jacket while out hiking or at the trap range, as those lower pockets are easily filled with shotgun shells. It will work fine when I manage to pick up another .375H&H safari rifle, but it would be nice if it had some cartridge loops. It can be machine washed warm, or dry cleaned. You can starch and iron it, or leave it a bit frumpy, which is what I have done. Overall, I think it is a good product and well made to Beretta's product specifications. The Company's apparel customer service is also first-rate from the three transactions I have made with them over the past two years. Bring out your inner Stewart Granger! Copyright 2015, 2016 by David Tong and/or chuckhawks.com. All rights reserved.